Continental has introduced short- and long-range radar sensors with optional Classical CAN and CAN FD connectivity. Series production will start in 2019. The introduced radar sensors have not only greater capacity, They are also based on a scalable modular principle, which, with its graduated function scopes, flexibly supports vehicle manufacturers’ different requirements and electrical-electronic (E/E) architectures. Due to the worldwide trend of using 77-GHz technology, the resolution of the sensors is becoming higher and facilitating, for example, more accurate detection of smaller objects such as a lost spare wheel or an exhaust that has fallen off. With long-range radar, a range of up to 300 m and an opening angle of ±60° are possible in the highest expansion stage depending on the required performance. With short-range radar, precise parking functions can be executed easily for the first time, in addition to functions such as blind spot detection, lane change assist or rear cross traffic alert. Continental’s radar sensors are already widely in use. The previous four generations sum to about 30 million units installed in vehicles. Many of them provide Classical CAN connectivity. Measured against the scope of its performance, the development leap of the fifth generation lies in its compactness and flexible usage. 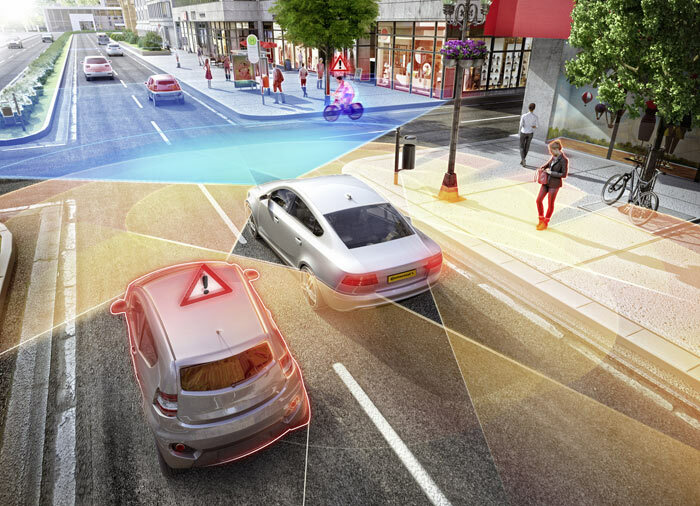 “This makes it easier to use them across entire vehicle platforms,” explained Norbert Hammerschmidt, Head of Program Management Radar at Continental. “In addition, the fifth generation can be used as a defined interface in the sensor and modular hard and software, either as a stand-alone product or even as a pure radar head without dedicated evaluation.” In this case, the picture of the surroundings produced by the radar is sent to a central control unit. In this way, different E/E architectures of vehicles can be covered using a single sensor concept. In addition to today’s Classical CAN and CAN FD connectivity, the fifth generation is already prepared for Automotive Ethernet. “This means that the necessary bandwidth for transmitting sensor raw data to our Assisted & Automated Driving Control Unit is available,” said Hammerschmidt. One of the features of the new generation is a higher resolution compared to the previous radar generations, with which a more exact picture of the traffic situation can be gained. In addition, road limits such as curbstones as well as the height of objects like the tails of a traffic jam under a bridge are detected thanks to the sensors’ elevation measurement accuracy. Even the entry-level variant of the long-range radar has a range of 200 m and an opening angle of ±45°. The expansion stage currently in preparation will look 300 m in front, with an opening angle of ±60°. “A large opening angle is important in supporting autonomous emergency braking at crossing traffic at intersections, while also detecting motorbikes and cyclists,” said Hammerschmidt. All new car registrations must fulfill these safety requirements from 2020 onwards in order to achieve the top grade of “five stars” in the European New Car Assessment Program (Euro NCAP). If four of the short-range radar sensors are installed on the corners of the vehicle in question, the larger opening angle and the higher resolution facilitate a seamless 360° radar “safety belt” all around the vehicle. Such detailed and seamless display of the entire area surrounding the vehicle is important. Without it, the vehicle will not be able to take on the driver’s tasks in automated driving. 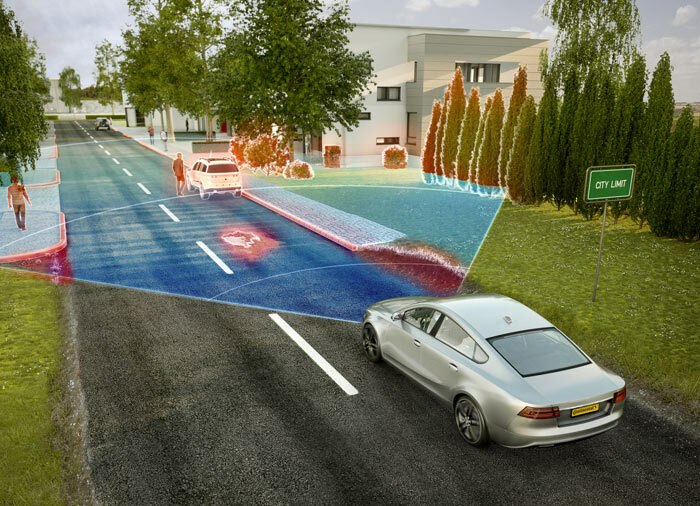 In conjunction with other sensors such as the camera, surround view systems, and 3D flash lidar sensors, the goal of achieving an understanding of the vehicle surrounding that is equal to, or better than, that of a human being, is coming that bit closer. An established strength of Continental’s radar sensors can also be found in the fifth generation. It is called auto-alignment, and uses a software function to automatically correct deviations from the sensor’s ideal location at its installation location on the vehicle. In order to meet the rising demand worldwide, Continental is expanding its production capacities. For example, production of long-range radar sensors was launched in Shanghai (China) in October of this year. The sensors are also produced in Germany, the USA, and the Philippines. The next radar generation is also a topic at the CES 2018 in Las Vegas (USA). Continental exhibits in North Hall at booth 6106.